The dagger depicted here is called a left-handed dagger or main gauche. It was produced for Plimoth Plantation's Wampanoag Indian Program, and is worn as an English trade item by an interpreter playing the role of Hobomock. 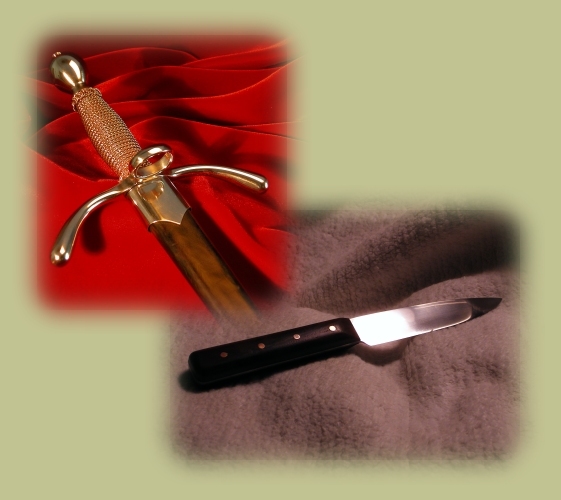 The left-handed dagger was used for blocking and sometimes trapping the thrusts of a sword or rapier. It was widely used in England, and consequently in the early American colonies for a relatively short period of time during parts of the 16th and 17th centuries. Though these daggers are widely depicted in paintings and prints, very few examples exist today. Examples from collections all over the world were referenced to provide clues to the techniques used in making these weapons. Details such as how the blade was welded and how the handle was wrapped took a lot of research to uncover. In the end we came up with a product that both owner and maker could be proud of. Incidentally, the thin metal used on the sheath was the scrap from the making of a shovel. This project illustrates the versatility of iron and steel. The knife shown here is a rigger's knife made for the master rigger on the Mayflower. By now it is surely covered in tar and well used.